This album is all about peacefulness. 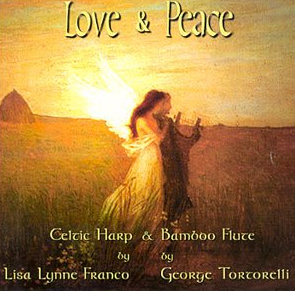 This is a very simple production of my harp, and George’s bamboo flutes, some of his other special flutes like recorders and pan pipes are layered together with his live looping technique which we do live when we perform. That means when he plays a line on his flute, he will hit a delay pedal or “looper” and play a harmony over the line he just played. He will trigger the same effect for the harp as well. It is all slow tempo soft music that has been a favorite of health practitioners, massage therapists, visual artists and anyone who just wants to mellow out. George and I have traveled and toured together since 1997, when we play live as a duo we sell the most of this album because its exactly how we sound. (video of one of the tunes played live below) George and I started playing together in 1997 so this is our first release. I was playing an art fair in Orlando, and he was selling his flutes in a booth at the same fair. We exchanged our albums, and went home, him to Florida, me to California.. When we heard each others albums we recognized similar qualities in each others music. This record is all our original collaborations, its very pure, and captures the very innocent sound of two of the worlds most ancient instruments. It was recently released by a record company New Earth Records as part of their health and well-being series.